To my left, a curious flying machine is suspended from a scaffold. To my right, a giant yellow squid wriggles its tentacles. The weather, naturally, is wildly erratic. Now in its 21st year, the Greenwich and Docklands International Festival has chosen ‘transformations’ as its theme, and there is something mercurial in the air. Vibrant and accessible, the programme features free, family friendly outdoor acts spread across several hubs around south east London. Here, you’ll see everything from grand public spectacles, to intimate performances you could find on any street corner. 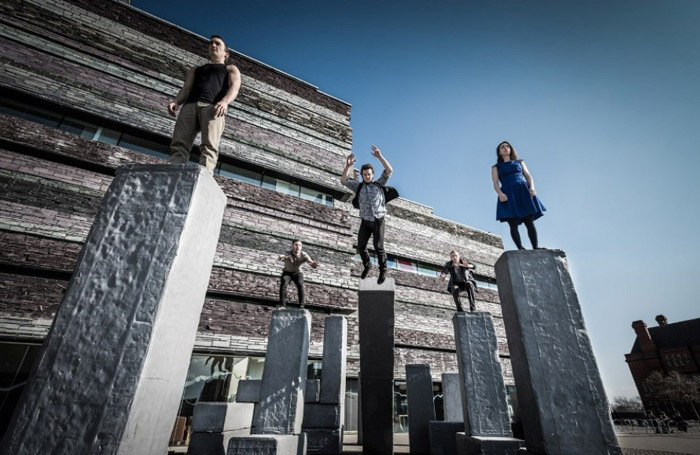 Block, for example, is a collaboration between NoFit State Circus and Motionhouse Dance, accommodating acrobatics and aggressive choreography verging on capoeira. Nimble artists chase, frustrate and, yes, block one another’s paths as they navigate a stack of sliding grey slabs, intercepting their competitors mid-leap, pulling platforms from under their feet. The fluid repurposing of these pedestals sees them used as springboards, ramps, and finally building materials for an imposing tower with the look and sense of stability of a giant game of Jenga. For a moment, the performers put aside their conflicts to cooperate in this construction. Then they inevitably quarrel, and tear it down again. Just around the corner, a quiet churchyard becomes the incongruous setting for Slapstick and Slaughter, a frequently hilarious piece of Dadaism from Desperate Men Richard Headon and Jon Beedell. Imagine Monty Python performed by Statler and Waldorf from the Muppet Show, repeatedly establishing and puncturing an air of portentous pomposity. Through a series of anarchic but consummately crafted sketches, they discusses the cultural impact of First World War the way Marcel Duchamp would have wanted – with ridicule, abstract sound poems, and hyperbolic shouting. It is painfully funny, but simultaneously subtle and disconcerting, as when Beedell recites every year from 1916 to present, with differing inflections reflecting the mood of the times. Taking a very different approach to themes of war and the resulting displacement of people, Polish company Teatr Biuro Podrozy presents Silence. A large scale, high-concept spectacle, the production blends pyrotechnics, stilt-walking and abstract physicality, set to a soundtrack of yearning cello airs and jaggedly-industrial metal riffs. Depicting a community carrying on normal lives during a nameless conflict, the show is full of haunting images. Child-sized mannequins articulated by the performers are cast as silent protagonists, and treated with touching tenderness as they play, dance, or flee in terror. A scene where they are evacuated from a dramatically burning structure feels frantic and genuinely dangerous. The performance takes place beneath an illuminated sign quoting Auden’s Refugee Blues. “This city has ten million souls.” It feels like a fitting motto for a diverse festival with an inclusive, international outlook.